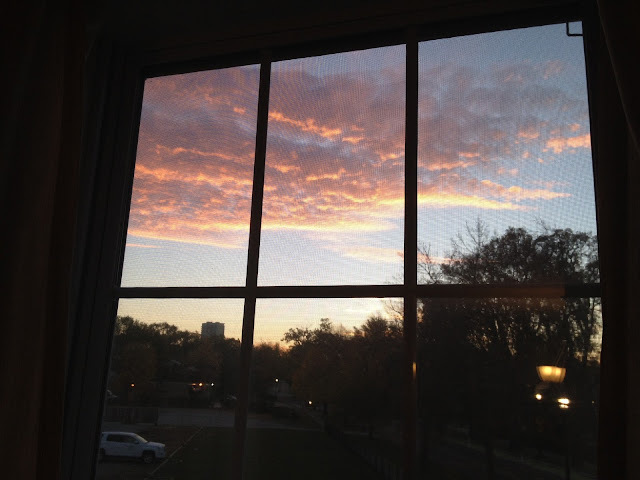 Craig took this picture at sunrise this morning because it reminded him of the sweater I'm knitting for Colton. Sweet guy. So without further ado - here is Colton's October Sunrise sweater. Isn't he getting so big? And his hair? Oh I love. But anyway back to the sweater. I really like the way the striping turned out. Although I must say it was tedious knitting at the end, all those small rounds for the arms and changing color every 22 stitches. Can you tell I ran out of orange yarn at the end?! I didn't have enough to finish the cuffs, so I had to improvise with the blue at the end. We're at the dunes at Lighthouse Beach this afternoon just before it started to rain. I'd never been to the dunes in town before, tucked away between the lighthouse and the water. Beautiful, don't you think? Hey there! Thanks for visiting our blog! Check out what Colton & Audrey, and their mommy & daddy, are up to. Thank you for not copying images or content from this site without my permission. Tiny Tea Leaves Cardi - Finished!